Unless you plan on spending your entire Maui vacation sitting by your resort pool, chance are you will want to rent a car while on Maui. There are lots of things to do and see on Maui, and having a car makes it a lot easier to get around this medium-sized island. When we go to Maui, we like to explore and visit new beaches throughout the week, and you need a car for that. If you plan on driving the road to Hana or seeing the sunrise up on Haleakala, you'll need a rental car. You can take cabs from resort areas back and forth from the airport, but most people flying into Kahului Airport (OGG) opt for renting a car right at the airport. (How much does a cab cost from Kahului to Lahaina? about $75.... to Kaanapali? about $87... to Kihei? about $40... not cheap). What car rentals are available at the Maui (OGG) Kahului airport? All the big names are there -- Dollar, Avis, and Budget are located right at the airport, while Thrifty is just a few minutes further. National, Advantage, Enterprise, and Hertz are also here. 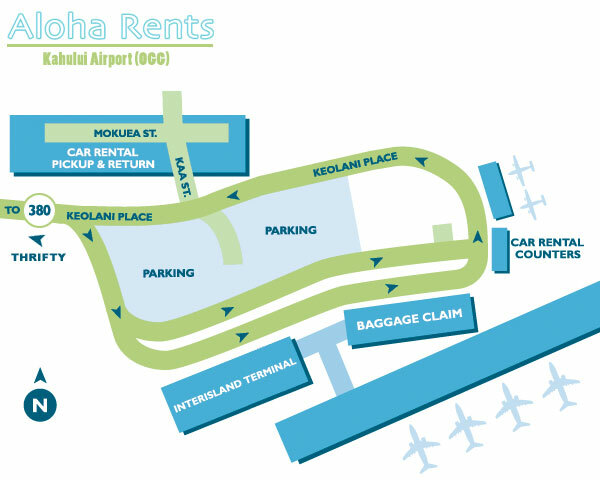 You can see a map here that shows the location of the Kahului car rental area - it's located just off the the backside of the traffic loop that goes around the airport. You can book a car in advance at any of their websites - remember the code for the main Kahului airport is OGG. There are rental kiosks at the airport near the baggage claim, but normally you jump on the shuttle bus for the 1 minute ride over to the rental car parking lot. After getting your luggage, head out and turn to your right -- you'll see the rental car shuttle bus area. Buses pick you up on the back side there - just wait for your rental car companies shuttle. To save time, we like to have the driver go ahead and pick up the car while the others grab the luggage. By the time the luggage has arrived, the driver can usually be back with the car and pick everyone up from infront of the baggage claim area -- then off you go, you don't have to drag the entire family on the shuttle bus and through the car rental lot. You can also rent cars from the smaller airport on Maui near Kapalua/Kaanapali on northwest Maui - their airport code is JHM and the location is just 10 minutes or so from Lahaina. You'll also find some of the big car rental companies in Lahaina, like Enterprise, Dollar, etc. So if you find yourself car-less in Kaanapali, Kapalua, or Lahaina, just pick up the phone and get yourself some wheels -- you don't need to go all the way back to Kahului airport to rent a car. You'll find a number of smaller, independent car rental places who will claim to give you the best deal -- we've never found a reason to skip the big national rental car chains, so do so at your own risk. Convertibles, 4X4s - What kind of car to rent? Convertibles are a popular choice when it comes to renting a car on Maui. Warm, sunny days and breezy nights almost scream out for a convertible. But keep in mind two things -- first, sprinkles are not uncommon on Maui, so you need to remember to put the top up if you will be away from the car for awhile. Second, just like when you are snorkeling, you can get a sunburn while driving around for an hour or two in the blazing sun with the top down, even though you may not feel it immediately with the wind in your face. So wear plenty of sunscreen. You also might hear stories about theft of belongings from vehicles, so certainly don't leave valuables lying around in a convertible or any car, even if you just run into a store or walk down the beach for a few minutes. You really don't need a 4X4 for driving around Maui. The roads around all the main areas are well maintained, and even the road to Hana has no threats bigger that one lane sections. So renting a Jeep 4X4 or an SUV may be fun, but you won't really need the offroad capabilities of any of these vehicles. Air conditioning is a must in the Hawaiian heat, and pretty much every rental car comes with AC these days. How much do rental cars cost on Maui? Expect to pay a minimum of $150-$200 per week for an economy or compact car, and about $250-$400 per week for a minivan. Shop around, we have found rates that differ by as much as 20% for the same size and style of vehicle. You can also rent cars just by the day if you want to plan a day trip and don't need a car for the whole week. Daily rentals can cost $25 to $75 per day, depending on what kind of vehicle you rent. Some people like to splurge while on vacation -- what's more exciting than renting an exotic car and cruising the sunny roads of Maui? Or some people want to rent a fancy car for a wedding or honeymoon. Whatever the reason, you can rent everything from Escalades and Hummers to Harley Davidson motorcyles to Ferraris, Vipers, Jags, and Mercedes. Check out AlohaToyStore.com. They have locations on Front St. in Lahaina and at The Fairway Shops at Kaanapali. For example, you can rent a Ferrari Modena 360 Spider (gorgeous yellow car, 400HP!) for $1500 per day. Or if you are going for really exotic, how about a Lamborghini Diablo? It comes with a 4 day minimum rental at $1300 per day -- perhaps the only V-12 car you will ever drive! Want to rent a Harley? These guys are also big into Harleys. How about a Harley Davidson XL 1200S Sportster rental for $150 for 24 hours? Of course you'll need a motorcyle drivers license to take out a hog. Another spot you can check out is IslandRiders.com, with locations in Lahaina and Kihei. They mostly rent motorcycles (Harleys and Hondas), but they also have some exotic cars for rent like a Cobra ($300 for 8 hours) or Miata. A 4X4 Jeep Wrangler Convertible is $69 per day.